My really quite rough-and-ready notes from Museums and Galleries Scotland’s ‘Collaborate to Compete’ conference. I’ve already posted my introductory notes for the session on ‘Entrepreneurship and Social Media’, so these notes are about the keynotes and the other sessions I attended. The first speaker was Jeremy Johnson from Australia’s Sovereign Hill, on ‘Engaging with China: the new horizon for cultural and heritage tourism’. He talked about their research-led marketing program aimed at getting Chinese visitors to Sovereign Hill, which included marketing work in China, hiring Chinese-speaking staff, and developing tailored tours and experiences. They’ve also hosted Chinese student[?] teachers in their education department and organised touring exhibitions. They also had to deal with talking about racism in the past treatment of Chinese Australians in Sovereign Hill – their technique is apparently to ‘tell it how it was’, but because Chinese Australians were ‘extraordinary contributors to society’ it was easy to focus on the many success stories. In general, they’ve developed some experiences to meet the expectations of Chinese visitors, but still, ‘the museum product has to be respected’. ‘Develop a market strategy to deliver visitor experiences at the right price’. The best marketing strategy can be undone if visitor experience does not meet the promise. Cultural awareness training essential for all staff and volunteers. ‘Bear in mind China isn’t a democracy, not everyone gets access to Google’. I then went to the first ‘New Partnerships’ seminar, where I heard lessons from the ‘Curious’ project at Glasgow Museums, including the possibility that ‘sustainability can be about working with different people at different stages rather than the one group of people working with the museum during the whole process’, and that ‘people put together objects in ways that curators never would’ (e.g. a ceramist put together objects from different parts of the world based on the presence of finger marks in the clay); partnership successes: mutual benefits, increased understanding, new opportunities, positive feedback; partnership challenges: managing expectations (also finding the right people to talk to), organisational structures, a draw on resources, tracking increases in visits. In the same session, people from the ‘Smart Collaborations’ project talked about conceptual frameworks for collaboration, with a focus on attracting and retaining visitors within an area – it was hard to see the slides, but it seemed to be about designing experiences for tourists. The top tip was: don’t be afraid to use offers, vouchers, or other deals to attract customers; and capture data when getting people in. The plenary talk before lunch was Stuart Dempster (JISC’s Strategic Content Alliance) on ‘Sustaining Digital Resources’ [earlier report at Business modelling and sustainability, new one will go live there next month ?]. If the digital age is a game-changer for institutions, how can bricks-and-mortar organisations not only be on the web, but of the web. What skills, licensing need to be in place? They’ve been looking at business models, including the effects of economic downturn and government cuts. Funded projects must deliver value to users, not just driven by curatorial concerns; a key concern is how to generate new forms of income with integrity. After lunch, Alphonse Umulisa, Director General of The Institute of National Museums of Rwanda spoke on ‘Repositioning Cultural Tourism’. Previously at the Museum of London, his job is to raise awareness about Rwanda’s history and heritage sites – difficult when Rwanda’s history is so painful. They’re trying to look forward to the future, and forget the past, but even knowing where to start was hard. He said you can’t learn history in schools in Rwanda – it’s not taught – but you can learn Rwandan history in museums. The museums had to change from research institutions to learn how to attract tourists, and they had to get Rwandans visiting museums again. His talk was both utterly humbling – the Rwandan government’s vision for 2020 is for every family to have a cow – and inspiring – his motto is: ‘discover your museums, cherish your heritage’. Tony Butler has posted his own notes from his inspiring talk on how the Museum of East Anglian Life transformed itself from a failing organisation to a thriving enterprise, and about his aim to make it a participative institution, a space for co-creation or to help people look at the world differently and to place the museum in the rhythm of daily life. After my session on ‘Entrepreneurship and Social Media’, I went to a workshop on ‘Smarter Museums’ with Anne Murch (who prefers the concepts of resilience or entrepreneurship to ‘sustainability’). The workshop covered the principles of a ‘thinking environment’: appreciation, attention, equality, incisive questions. We did a really interesting (and at first, challenging) exercise in pairs, where you had to either just listen, or just talk, for three minutes, before swapping with your partner. It’s hard – if you’re meant to be listening, you want to encourage the person talking, or if you’re talking, you want to stop and let the other person have a go. We did it again later, and it was much easier. We were also asked to consider “if we knew that together we can have a thriving museum that provides the very best experience for our visitors, what would the org look and feel like? What is the shift we need to make to deliver this?”, and the importance of diversity as both the identity of the people that are shaping the future plans and the ideas that are generated. A team that takes a ‘diagonal slice’ across and down through the museum can be effective – the people with least power are often most creative and least encumbered. Another suggestion for better meetings was to frame each agenda item as a question. I’m in Edinburgh for the Museums Galleries Scotland conference ‘Collaborating to Compete’. I’m chairing a session on ‘Entrepreneurship and Social Media’. In this context, the organisers defined entrepreneurship as ‘doing things innovatively and differently’, including new and effective ways of working. This session is all about working in partnerships and collaborating with the public. The organisers asked me to talk about my own research as well as introducing the session. I’m posting my notes in advance to save people having to scribble down notes, and I’ll try to post back with notes from the session presentations. Welcome to this session on entrepreneurship and social media. Our speakers are going to share their exciting work with museum collections and cultural heritage. Their projects demonstrate the benefits of community participation, of opening up to encourage external experts to share their knowledge, and of engaging the general public with the task of improving access to cultural heritage for all. The speakers have explored innovative ways of working, including organisational partnerships and low-cost digital platforms like social media. Our speakers will discuss the opportunities and challenges of collaborating with audiences, the issues around authority, identity and trust in user-generated content, and they’ll reflect on the challenges of negotiating partnerships with other organisations or with ‘the crowd’. 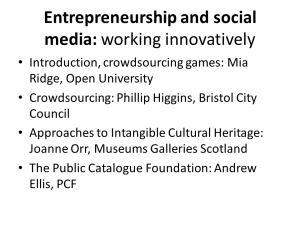 You’ll hear about two different approaches to crowdsourcing from Phil Higgins and Andy Ellis, and about how the ‘Intangible Cultural Heritage’ project helps a diverse range of people collaborate to create knowledge for all. I’ll also briefly discuss my own research into crowdsourcing through games as an example of innovative forms of participation and engagement. If you’re not familiar with the term, crowdsourcing generally means sharing tasks with the public that are traditionally performed in-house. 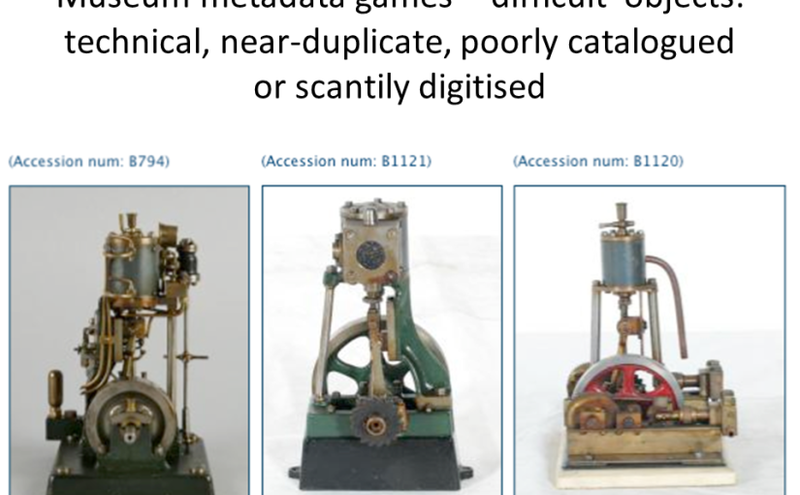 Until I left to start my PhD, I worked at the Science Museum in London, where I spent a lot of time thinking about how to make the history of science and technology more engaging, and the objects related to it more accessible. 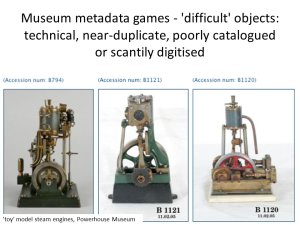 This inspired me when I was looking for a dissertation project for my MSc, so I researched and developed ‘Museum Metadata Games’ to explore how crowdsourcing games could get people to have fun while improving the content around ‘difficult’ museum objects. Unfortunately (most) collections sites are not that interesting to the general public. There’s a ‘semantic gap’ between the everyday language of the public and the language of catalogues. Projects like steve.museum showed crowdsourcing helps, but it can be difficult to get people to participate in large numbers or over a long period of time. Museums can be intimidating, and marketing your project to audiences can be expensive. But what if you made a crowdsourcing interface that made people want to use it, and to tell their friends to use it? Something like… a game? 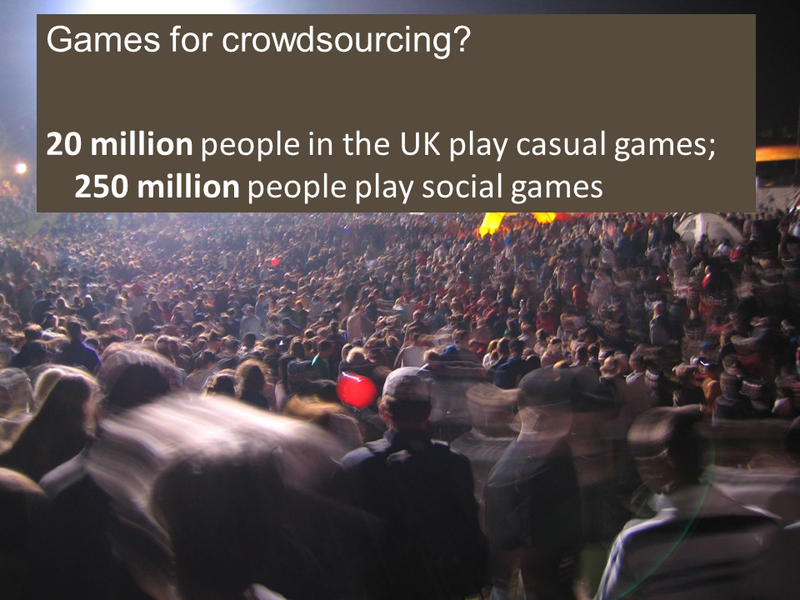 A lot of people play games… 20 million people in the UK play casual games. And a lot of people play museum games. Games like the Science Museum’s Launchball and the Wellcome Collection’s High Tea have had millions of plays. 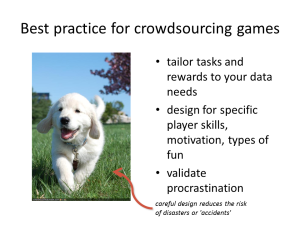 Crowdsourcing games are great at creating engaging experiences. They support low barriers to participation, and the ability to keep people playing. As an example, within one month of launching, DigitalKoot, a game for National Library of Finland, had 25,000 visitors complete over 2 million individual tasks. Casual game genres include puzzles, card games or trivia games. You’ve probably heard of Angry Birds and Solitaire, even if you don’t think of yourself as a ‘gamer’. Casual games are perfect for public participation because they’re designed for instant gameplay, and can be enjoyed in a few minutes or played for hours. Easy, feel-good tasks will help people get started. Strong game mechanics, tested throughout development with your target audience, will motivate on-going play and keep people coming back. Here’s a screenshot of the games I made. In the tagging game ‘Dora’s lost data’, the player meets Dora, a junior curator who needs their help replacing some lost data. Dora asks the player to add words that would help someone find the object shown in Google. 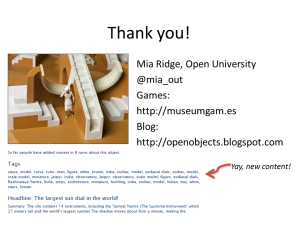 When audiences can immediately identify an activity as a game – in this the use of characters and a minimal narrative really helped – their usual reservations about contributing content to a museum site disappear. The brilliant thing about game design is that you can tailor tasks and rewards to your data needs, and build tutorials into gameplay to match the player’s skills and the games’ challenges. Fun is personal – design for the skills, abilities and motivations of your audience. People like helping out – show them how their data is used so they can feel good about playing for a few minutes over a cup of tea. 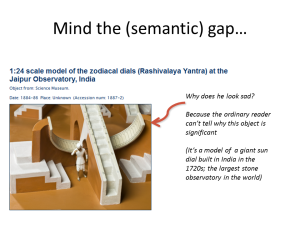 You can make a virtue of the randomness of your content – if people can have fun with 100 historical astronomy objects, they can have fun with anything.